I love brownies. They have to be one of my favorite desserts. If chocolate cake and a double chocolate cookie had a baby, it would be a brownie. Now, everyone has preferences regarding brownies. Some people like their brownies chewy in the center but a little crisp on the outside – like the edge pieces from a baking pan. 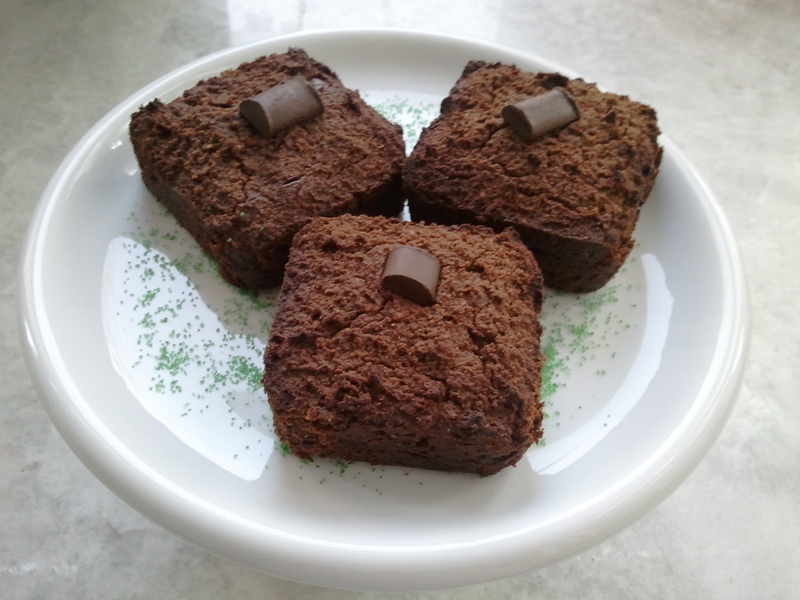 Some people like their brownies chewy all the way with a soft exterior – those are the people that like the middle pieces from the baking pan. Some people prefer a flaky, crunchy top to their brownies. My point is there are a lot of options when it comes to making brownies. I like a gooey center, Monkey Man likes crispy edges. Grease a 9 X 9″ baking pan (if you don’t have that exact size, don’t worry) or brownie square baking pan – coconut oil spray works great for this and gets in the corners. Mix flours, arrowroot starch, cocoa powder, baking soda and salt in a small bowl. In a large mixing bowl, beat eggs with agave nectar, palm sugar and vanilla until the mixture becomes fluffy. Add the applesauce and coconut milk and beat another 2 minutes. Add the flour mixture gradually, alternating with the oil. Be sure to have no lumps. This batter is thicker than your average brownie mix (unless you’re making Parker brownies). 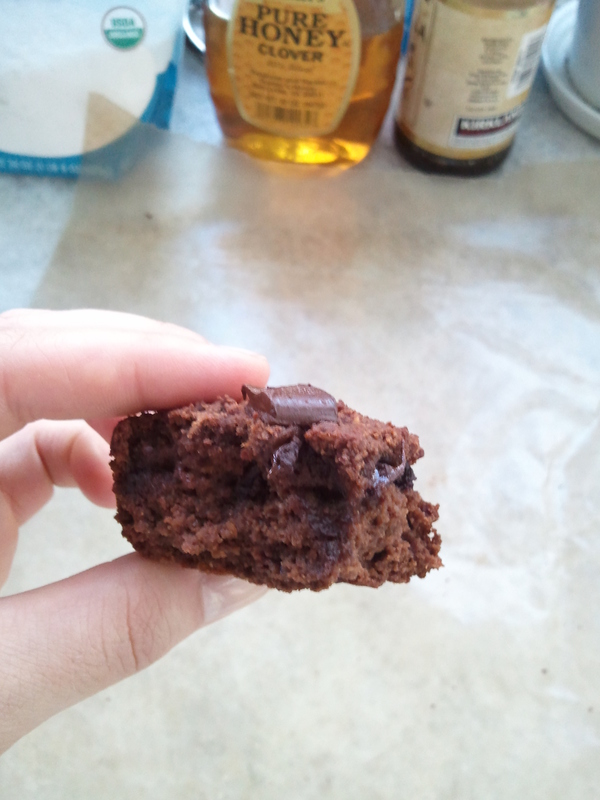 Fill the brownie pan half way with batter and add chocolate chunks. Now, add the peppermint extract to your remaining batter and mix. Fill the baking pan with the remaining batter. I chose to garnish with a single chocolate chunk on top…. Now bake the brownie batter for 25-30 minutes. This is really dependent on how you want your brownies to turn out. I bake mine for about 24 minutes and let them cool on a cooling rack for about 15-20 minutes. This provides a nice chewy center, but ensures that they’re fully cooked. 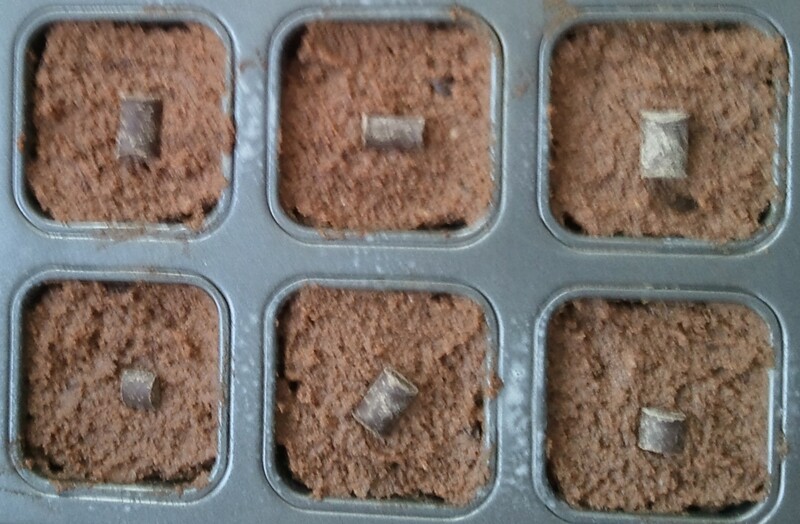 You can check their “doneness” by inserting a toothpick into the center of brownie. If, when you pull it out a little sticks to the toothpick, it is ready to be pulled from the oven. If your toothpick is coated, it’s not done yet. 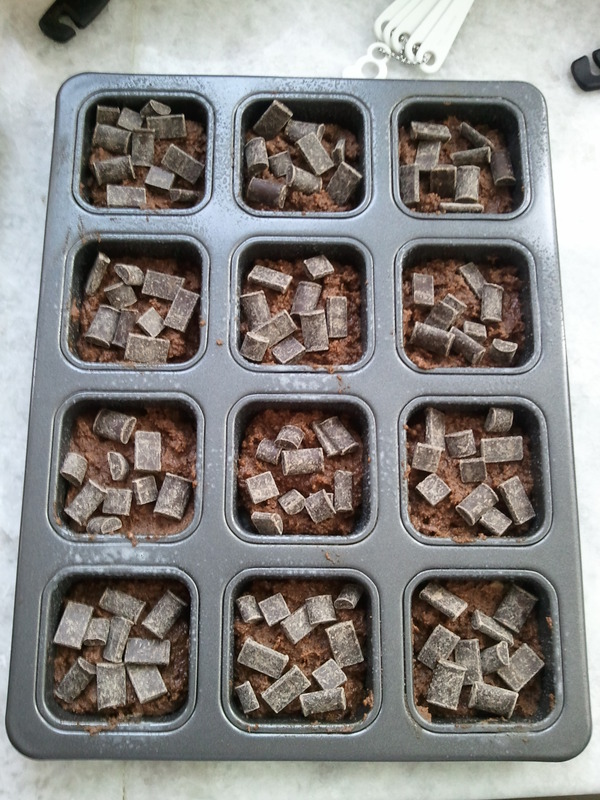 Because I use a brownie pan, all brownies have some crisp to their edges – that makes Monkey Man happy. If you don’t like crispy edges, just use a large baking pan and cut off your edges once their finished baking. If you don’t care about a crunchy, flaky crust on top (I did not this particular batch), just add everything to the large mixing bowl at once and mix. Adding the sugar to the eggs first makes a crunchy, flaky crust. If you like your brownies extra gooey, bake them less. If you like them more like bricks, bake them more 😛 If you want a cakey brownie, sub 4 egg whites for the eggs. This entry was posted in baked good, chocolate, dessert and tagged brownie, chocolate chunk, peppermint. Bookmark the permalink. Nicole, I’ll be trying this soon!